Tipico is the biggest german bookmaker in sports betting. 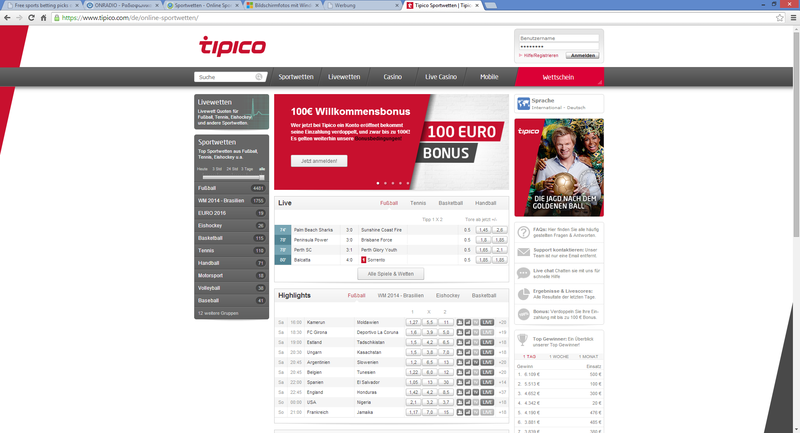 In Germany Tipico has many local betting offices. In television the betting company is presented by the goalkeeper Oliver Kahn. Unless sports betting, Tipico offer live casino games like blackjack and roulette. The deposit bonus on Tipico is 100% up to 100 EUR. If you deposit 100 EUR you will get 200 EUR on your betting account. To get a payout of all this amount you have to bet the deposit amount and the bonus amount 3 times. That means you have to bet totally 600 EUR. From time to time you will receive other attractive bonuses of 50% up to 100 EUR or 200EUR. The betting program of Tipico is focused on soccer betting mainly. For soccer you will find a big selection of bets. They are offered matches for the big leagues but many other for small regional leagues from many european countries. This is a big advantage for soccer fans thaz follow the low regional leagues. The advantage is that they know the teams better than the bookmakers. You can bet in many kind of ways. Tipico offer bets on the winning team, over under with goals, handicap, goal scorers, halftime endtime, corners and much more. You can also bet on many tennis, basketball and ice hockey bets. On every time there exist many bets for live betting. So if someone likes there are always opportunities to bet. The odds for live betting matches on Tipico are very high so it is worth to bet live on Tipico. Also many live bets are offered for tennis and basketball. The security is very important for Tipico. All transactions are encrypted and the datas of the customers never are given to third parties. All transactions are encrypted with a ssl certificate. All datas are handled very carefully on Tipico. The odds on Tipico are very high. The payout rate is about 30%. The big advantage for german players is that Tipico doesn't calculate the 5% taxes. So Tipico is a very good choice for betting. The support responses very fast to the inquiries of the customers. You can contact the support with e-mail or with telephone. The customer support can be reached all the time. The graphical interface of Tipico belongs to the best on online betting. The used colors are red and white. The odds, navigation and bet placing have a good overview and usability. If you visit the main page you will see on the right toolbar the highest winnings from the previous day. On the left sidebar you can choose the sports you wish. When you have choose the spirts than you can select the league of the country you want. Than you can see all matches with their odds. Now yiu are ready to place the bets on Tipico.